EDITORS NOTE: Earlier this year, Investigative Reporter Deanna Lynn Wulff discovered the Peripheral Canal‘s 12 Billion dollar projection may be closer to 40 billion. 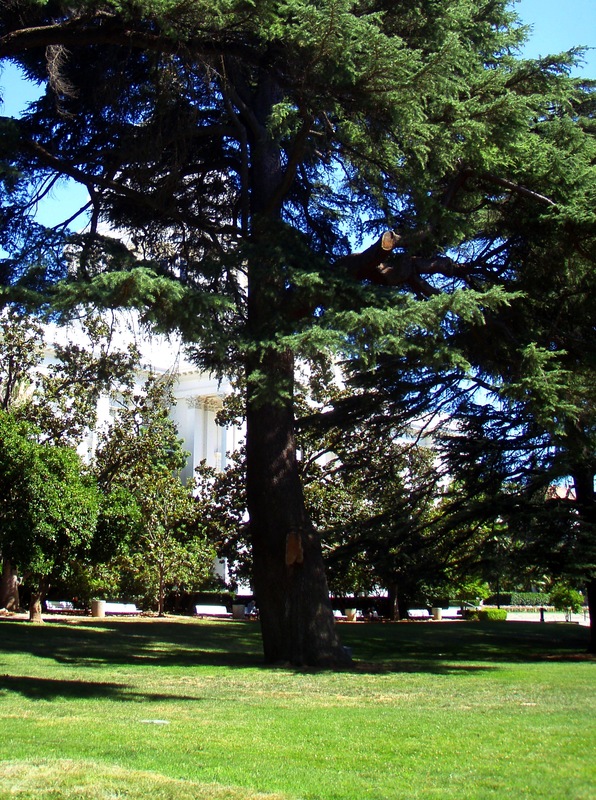 SACRAMENTO – Assemblyman Bill Berryhill announced April 24, 2012 that the Assembly Committee on Water, Parks and Wildlife passed out two common sense water measures, Assembly Bills 2421 and 2422. There appears to be much room for improvement. Outdoor water use accounts for 42 percent of urban use in California; this includes lawns, large landscapes, parks, golf courses and cemeteries, and a portion of commercial and industrial water use. But regional use varies significantly. In Los Angeles, outdoor use accounts for 70 percent of residential use. In June 2009, an ordinance limiting lawn and garden watering to two days a week went into effect, and Los Angeles water consumption dropped by more than 20 percent. In that same year, the state legislature passed Senate Bill X7-7, which requires urban water suppliers to reduce use by 20 percent per person by 2020. Already, some water suppliers, particularly West Basin Municipal Water District (West Basin) in Los Angeles, are close to meeting the requirement. “In the early 1990s, we were relying on imported water from the Metropolitan Water District and then we had a drought, and that’s when we built our water recycling facility,” said Gus Meza, West Basin Senior Water Use Efficiency Specialist. “Now, 65 percent of our water comes from the Met Water District, and our goal is to get down to 33 percent. We hope to do that by doubling conservation, doubling recycling and using desalination.” Several cities have already met the 20 percent goal, including El Segundo, Inglewood, Lomita and Manhattan Beach. 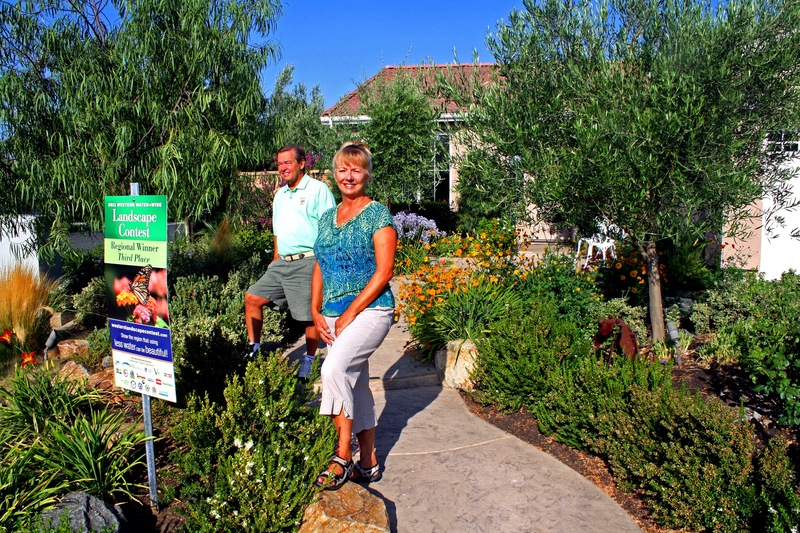 More recently, a coalition of Southern California water agencies, including Chino Basin Water Conservation District, Inland Empire Utilities Agency and Western Municipal Water District, worked with Home Depot to encourage water-efficient landscaping. Water suppliers inserted 630,000 notices into monthly water bills, inviting customers to save up to 50 percent on water efficient plants and supplies. For 10 Saturdays in 2011, parking lot sales took place. Sales at two stores jumped 150 and 200 percent, and seven other stores had sales increases of 50 to 100 percent. This creates a win-win situation for consumers, retailers and water agencies promoting conservation. For urban and suburban users, conservation doesn’t actually cost money over time; it creates a net savings. 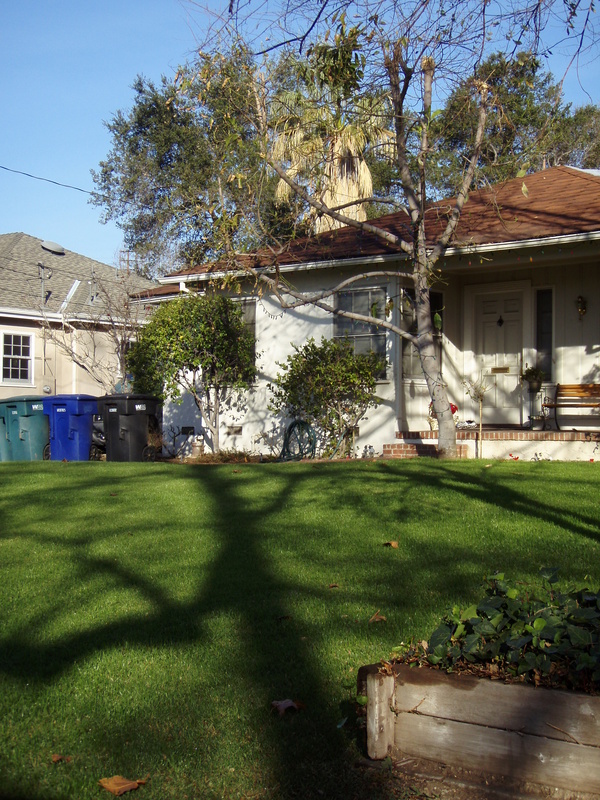 Residents can also receive reimbursements directly from water agencies for replacing their lawns, at $1 per square-foot. Eastern Municipal Water District has put $100,000 into a turf buy-back program. “One of the interesting things about that program is that we are also targeting Home Owner Associations (HOAs) in these areas,” said Peter Odencrans, senior public affairs officer for Eastern Municipal Water District. HOAs constitute one-third of residential housing in California. 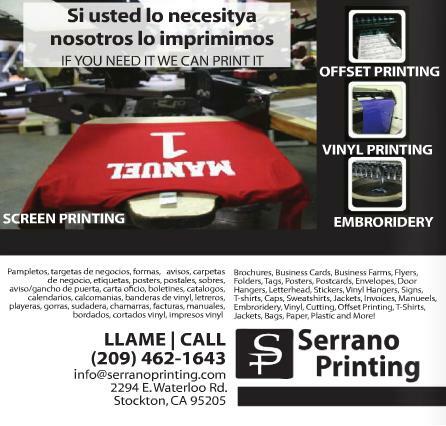 “We have applications for 20,000 square feet, and we still have 80,000 square feet available.” The program runs to June 2012. 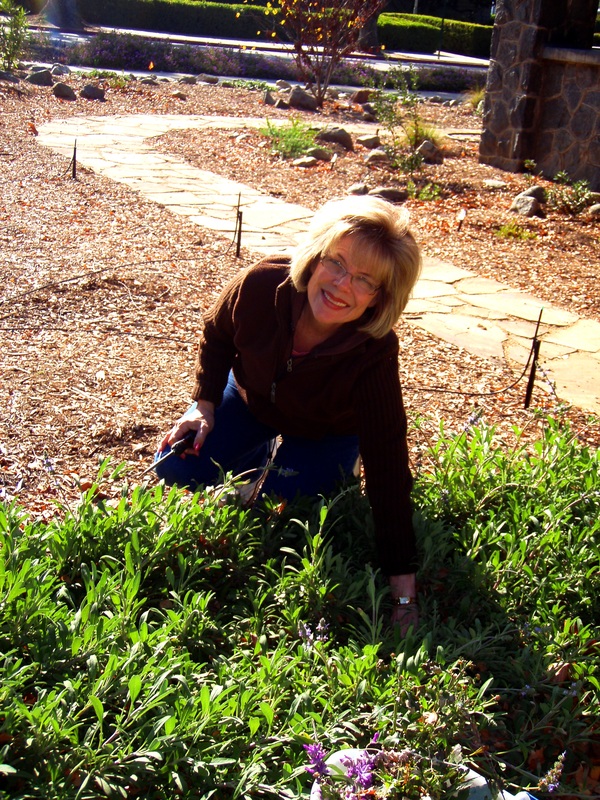 Paula Albrigo gardening in her re-designed drought-resistant front yard. 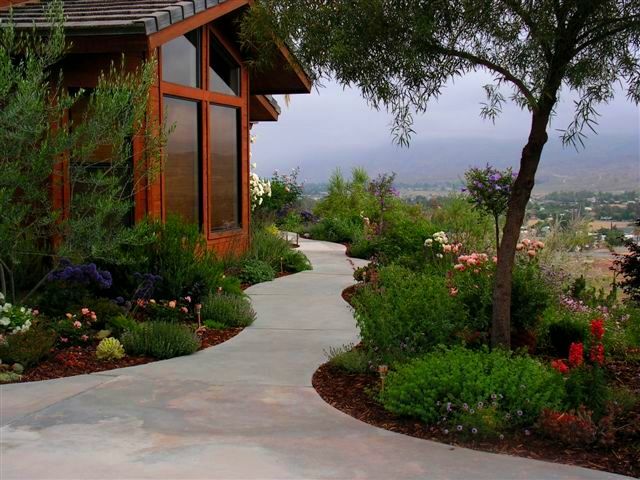 State law backs drought-resistant landscaping, as well. 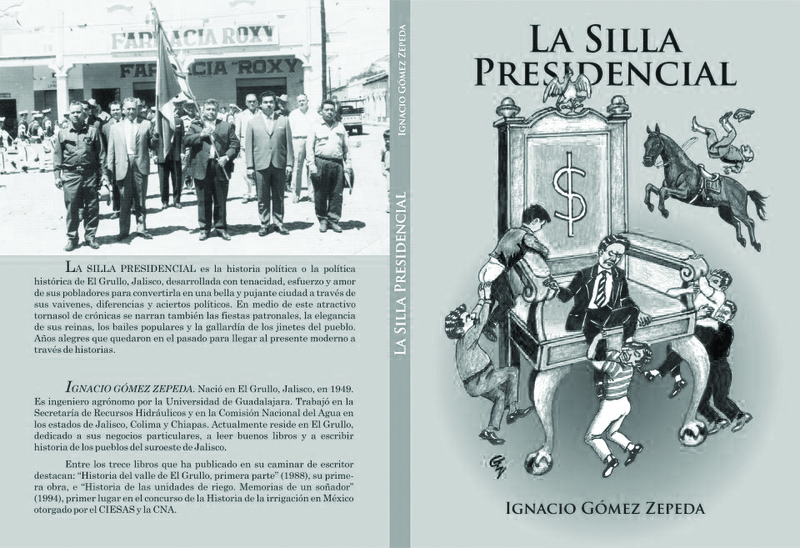 In 2009, the state legislature passed A.B. 1061, and now HOA rules that interfere with water-efficient landscaping are void and unenforceable. A homeowner also cannot be fined by an HOA for putting in water efficient plants and replacing lawns. Water recycling is yet another way to increase water supply. Many water agencies and districts are treating sewer water and reusing it for irrigation, industrial processing and groundwater recharge. 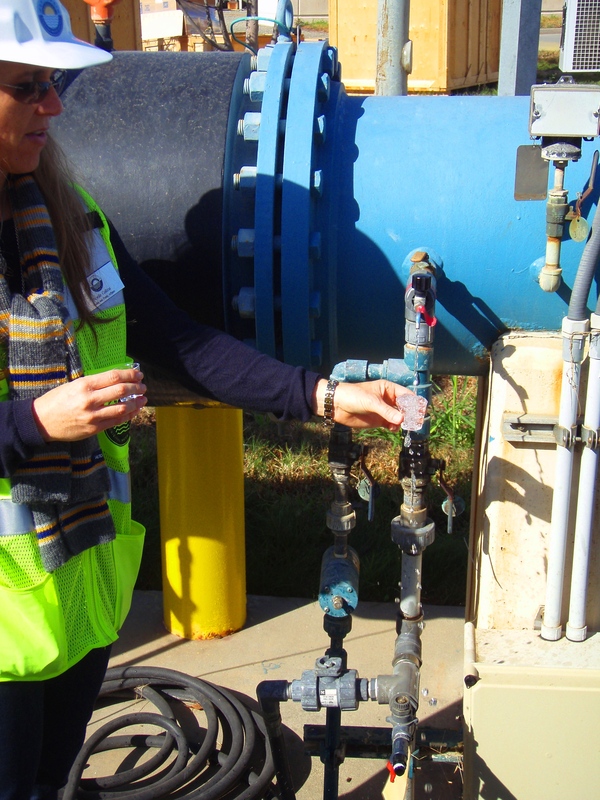 After reprocessing waste water with microfiltration, chemicals, ultraviolet light and reverse osmosis, purified water is piped to customers who are hooked up to specific pipes for specific types of water. Chevron, for example, uses “designer” recycled water in its refinery and boiler operations. California has more than 250 water recycling plants currently operating, and in 2009, the state recycled approximately 724,000 acre-feet of waste water. An additional 1.85 to 2.25 million acre-feet of wastewater could be recycled by 2030. That’s nearly the average annual flow of the Merced and Tuolumne Rivers. 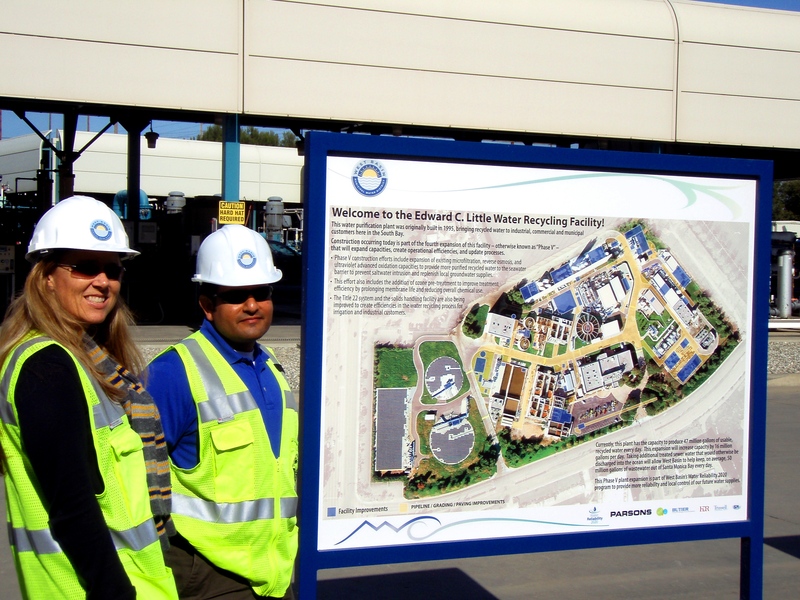 One of the largest recycling facilities in the U.S. is West Basin’s plant in El Segundo. West Basin serves nearly a million people in Los Angeles, and its recycling facility produces five different qualities of water for municipal, commercial and industrial customers. Some of its recycled water is also used to recharge ground water, which eventually ends up in the drinking water supply. “The recycled water comes from reprocessed sewage, and it has to be put in separate purple pipes, but after processing, it is more pure than bottled water. You can drink it,” said Noelle Collins, West Basin Media and Public Affairs Specialist. 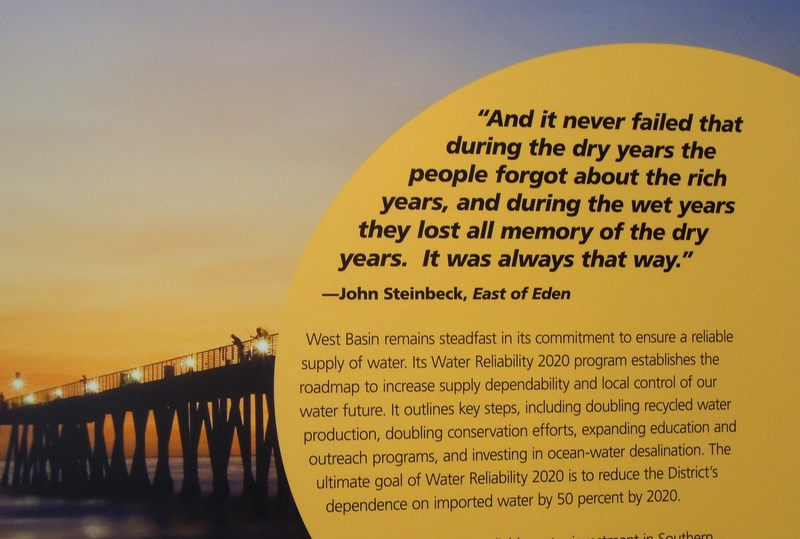 Desalination is another technology being experimented with by West Basin and several other water agencies in California, but currently, its costs, energy expense and potential effect on the environment make it less useful than recycling and effective conservation. That said, there are still major gaps in California’s conservation policies. Urban water metering is required by state law by 2025, but the City of Sacramento has installed only 27,600 of the required 110,000 meters since the city began its program in 2005. The city of Fresno and more than half San Joaquin Valley residents are also not metered. The flat water rate for some Fresno customers is $28 per month, regardless of use, and the city has some of the highest water consumption per household. But by 2013, all city of Fresno customers will be metered. The city of Stockton’s water is metered. But California can’t ignore the largest water consumer—Agriculture, which uses 70 to 80 percent of the available supply. Senate Bill X7-7 bill requires urban users to reduce use by 20 percent per person by 2020, and agricultural water suppliers to measure the volume of water delivered to customers and adopt a pricing structure based on the quantity delivered. Thus far, reporting of agricultural water deliveries is set to begin July 31, 2012. No goal has been set for reduced use. The next Delta article in this series will investigate the costs, conflicts and challenges associated with agricultural conservation and water measurement. SACRAMENTO, CA – Culminating the Day of the Dead/Dia de los Muertosfestivities this year,La Raza Galería Posada, Sacramento’s Latino art and cultural center, brings the Panteon de Sacramento (Sacramento’s Cemetery) to life.This isa two day/night outdoor display of fifty large, colorful altares. The altares will be available for public viewing on Saturday October 29 and Sunday October 30. Families, individuals, area artists and local not for profit organizations will build the altares for public display.Theatre, music, poets and children’s workshops are all part of the two-day event. 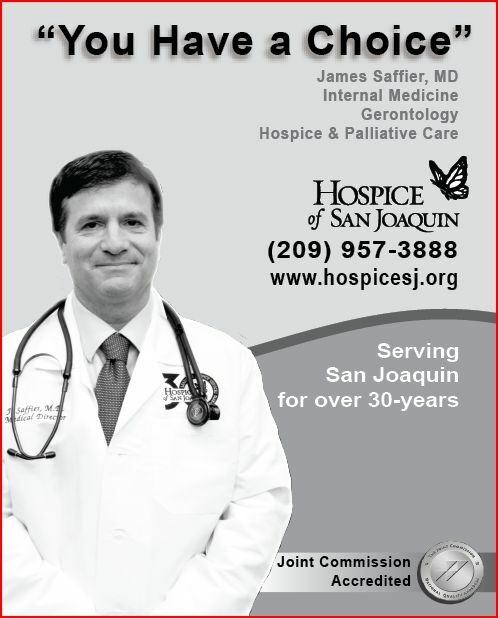 In Sacramento, Día de los Muertos has been celebrated since the early 1970s, commensurate with the Galería’s founding in 1972, 39 years ago. The Consulate General of Mexico in Sacramento is pleased to announce the XI edition of the Binational Health Week (BHW), from October 1st to16th, in 40 U.S. states and three Canadian provinces, with the participation of the consular networks from Mexico, Guatemala, Bolivia, Honduras, Colombia, Ecuador and Peru.